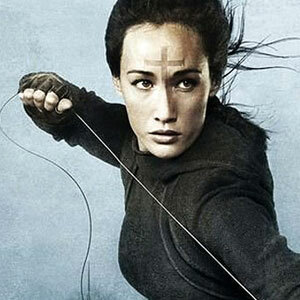 Maggie Q will showcase her martial arts skills in the upcoming supernatural thriller Priest. "When Priest (Paul Bettany) defies the orders of the Clergy by leaving the city on a perilous quest to save his niece from a murderous pack of vampires, the Council of Monsignors dispatches a team of warrior priests to bring him back, in Columbia Pictures’ new supernatural thriller Priest. "For the role of Priestess, the group’s leader, the filmmakers chose Maggie Q, a Hawaiian-born actress who brought martial arts skills honed in several Hong Kong action films. No stranger to Hollywood action roles, she starred in Mission: Impossible III, alongside Tom Cruise, and Live Free or Die Hard, with Bruce Willis. "Maggie was excited to work with the director of Priest. ’Scott Stewart is a bit of a throwback,’ she says. ’Scott has created a world that feels like a classic adventure, but you don’t know what year it is, what’s happened before or what’s going to happen next. It’s kind of undefinable and definitely original.’"
"Priest and Priestess have a long and conflicted history, having fought together during the Vampire Wars. They have deep feelings for each other that they have never been allowed to act on. ’Priestess remembers him very fondly from when they fought in the war,’ Stewart says. ’He was their leader, so he provided some sense of order and security for her. Maggie and I talked a lot about what had happened in the preceding years, and how that evolved into what in her mind is love.’"
"She adds, ’Honestly, I have never loved a crew more. In my career I have worked on amazing films with some great people, who I love. The experience in Priest with these actors and our crew has been amazing. We sometimes don’t think about it but the crew are actually the people who make the film happen. I miss them very much. I want to make another one with this exact crew because the chemistry was perfect. First of all, you have a star in the film that has the best attitude, which already sets the tone. Paul is just a charismatic, really wonderful, loving human being. We laughed and laughed all day long. It’s funny because when you see the film, there is so much drama in it and it can be very heavy at times but the minute they cut, we were rocking around the corner laughing because that was the mood on set.’"
"Maggie Q is an actress, humanitarian, and international spokesperson who continues to display her range through projects that have immense international appeal. Working opposite some of the world’s most established actors, including Hugh Jackman (Deception, 2008), Andy Lau (Three Kingdoms: Resurrection of the Dragon, 2008), Bruce Willis (Live Free or Die Hard, 2007) and Tom Cruise (Mission: Impossible III, 2006), she has continuously captivated audiences worldwide by showing her versatility in graceful and seductive roles. "Opening across the Philippines on May 11, Priest is distributed by Columbia Pictures, local office of Sony Pictures Releasing International."